Cool Jerk » Archive » Now offering worldwide shipping! I just shipped a book order out this weekend. Not terribly newsworthy in and of itself, and normally not worth mentioning in my blog, but this a little different. It was to Greece. A few years ago at San Diego Comic-Con, I met a fellow named Dimitris Sakaridis. He came up to my table and checked out my comic. Either he liked what he saw or my mind-controlling brainwave emitter worked, because he bought a copy of Hodabeast. While I was signing it off to him, he signed up for my weekly e-mailer. Thanks for the heads up. 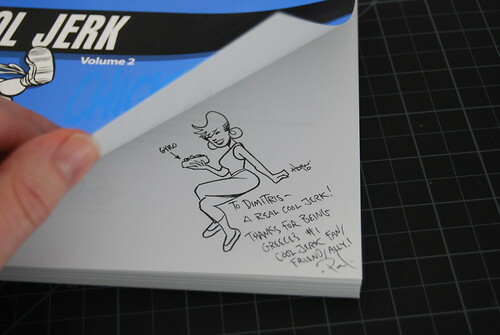 I’m actually trying to promote Cool Jerk to everyone I know here, since 2007. I met you briefly that year in San Diego Comic Con. You were actually the first exhibitor/creator I met on preview night and I’ve always been sorta emotionally attached to your strip. It being really cool and well made helps a lot! I’ll do my best to convince other people here to order your books. Fix the shipping charge thing soon. P.S. : Seriously, I feel bad about the no shipping thing. If I don’t manage to get more people to order your books, I’ll order a few more myself and start giving them away to those I love as gifts. Nice guy, that Dimitris. People like him make the world a smaller place. And to all of you readers from outside the U.S., I fixed that shipping glitch so YOU’LL HAVE TO PONY UP SOME EUROS LIKE EVERYONE ELSE! EPILOGUE: I’ve learned Dimitris is a reviewer and one of the head honchos at Comicdom, Greece’s premier comics news site. Also, he’s spearheading Greece’s only comic convention, ComicdomCon. If your travels take you to the birthplace of Heracles, Pythagoras and the Olympics, do what you can to help support the industry, won’t you? I had a similar int’l shipping rude awakening when one of my first U.K. customers ordered a comic via PayPal, for which I set a flat shipping rate. So for a $3.50 comic I spent about $6 in shipping. I added int’l shipping charges but quickly after that. Live and learn, huh?